Full on carb loading and sweet cravings are back in time for the weekend. Hope you’re hungry for some pancakes I made us a bunch! They may be full of carbs and sweets, but they are also plenty full of nutrition, including fiber. No need for any guilt. These are as good as they are good for you! I developed this recipe a few years ago and like to make it year round. I don’t know why it hasn’t ended up here yet because I know you will squeal with delight when you get to these. Please forgive me for holding back this breakfast meal that we have been eating all along to our hearts content. Because the weekdays are rush-rush I save this rolling-out-the-red carpet-kind-of-a-breakfast (at least for us here) for the weekend. It’s such a treat; especially when the kids see those shiny bananas on top. Our “red carpet” breakfast is lounging in (batter-stained would be me) pajamas, disheveled hair, and Super Why blasted on the TV. This makes carb loading weekends more enjoyable. Okay, maybe not Super Why with the volume cranked up to infinity, but you know what I mean. As much as I love the seasonal produce at our local farmer’s market and get excited to see what’s been harvested I do love the combination of banana walnut. Banana and walnut are like best buddies: they’re always around, and you know you can count on them to be available anytime you need a friend. 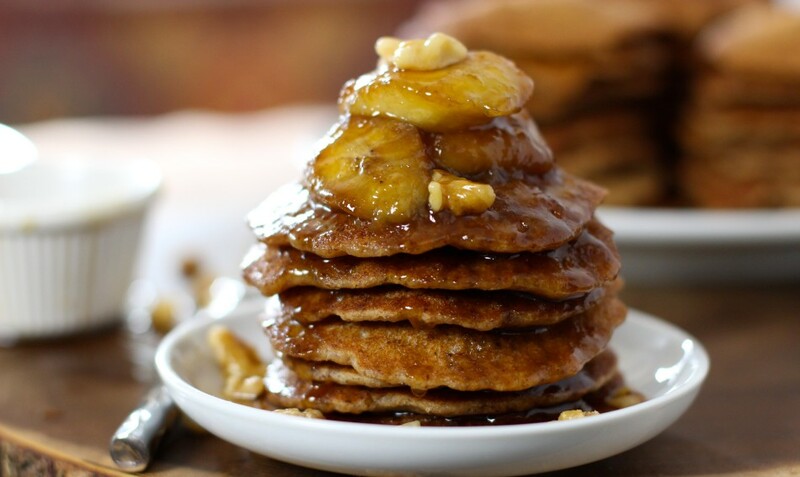 In this case, a big stack of super moist pancakes bathed in sweet syrupy bananas. Yes, my friends, you need this. Weekends are made of this. When my oldest son is home (most weekends) I make meals egg free since eggs give his sneezing attacks. 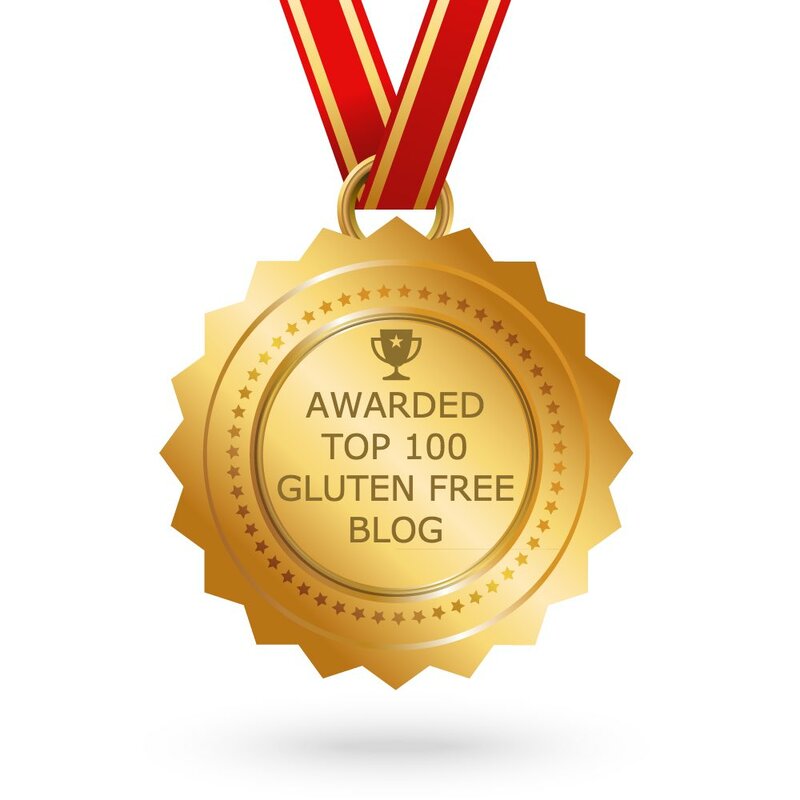 We discovered this after doing an allergy elimination diet. We thought it was potato but then reintroduced the egg and realized he can’t tolerate eggs. If you cannot tolerate eggs or don’t eat eggs then this is the pancake recipe for you. 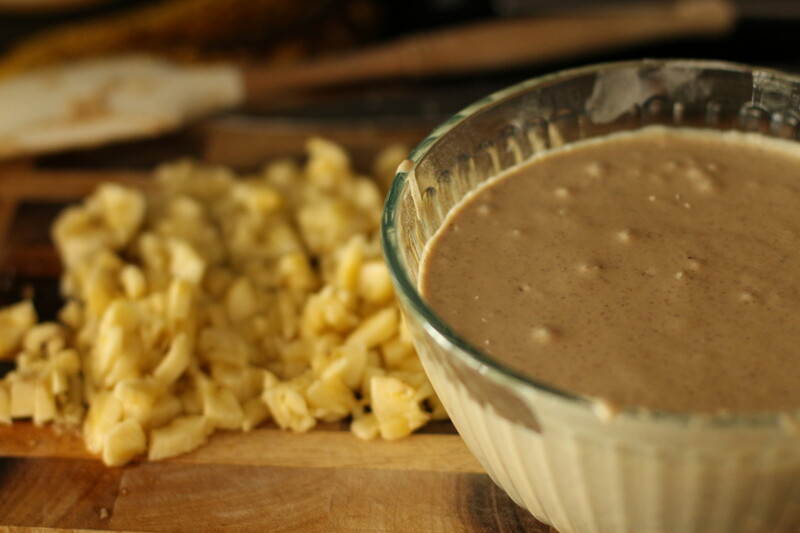 The blender (a food processor -be careful not to fill to the top or it will spill over, or an immersion blender work well too) is key for this recipe. It may not seem like it’s necessary, but it is. I have tried to mix this all up in a bowl, but it just doesn’t yield the light, fluffy pancakes I was looking for no matter how I varied my preparation steps. 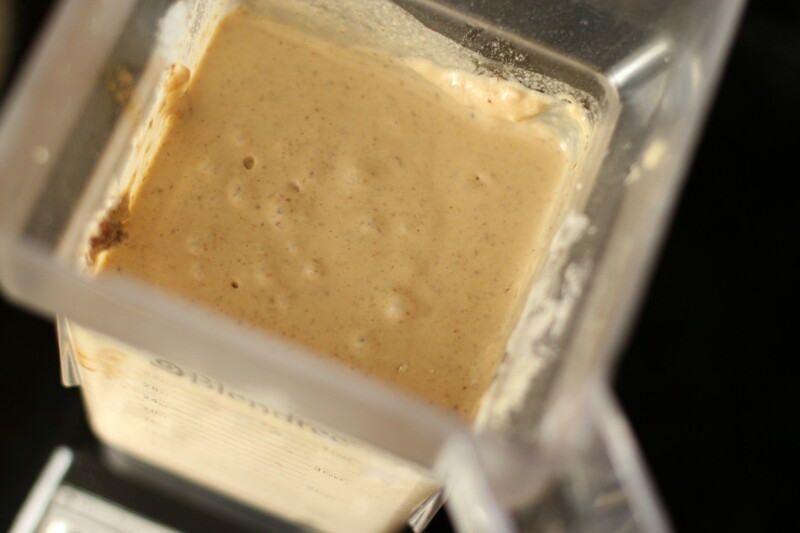 The coconut oil needs a good aerating in the blender to evenly distribute in the batter. I find that when using coconut oil in a cold batter it quickly solidifies when the cold liquid is added, leaving clumps in the batter, which melt unevenly when you make the pancakes. No inconsistent pancakes for us my friends. 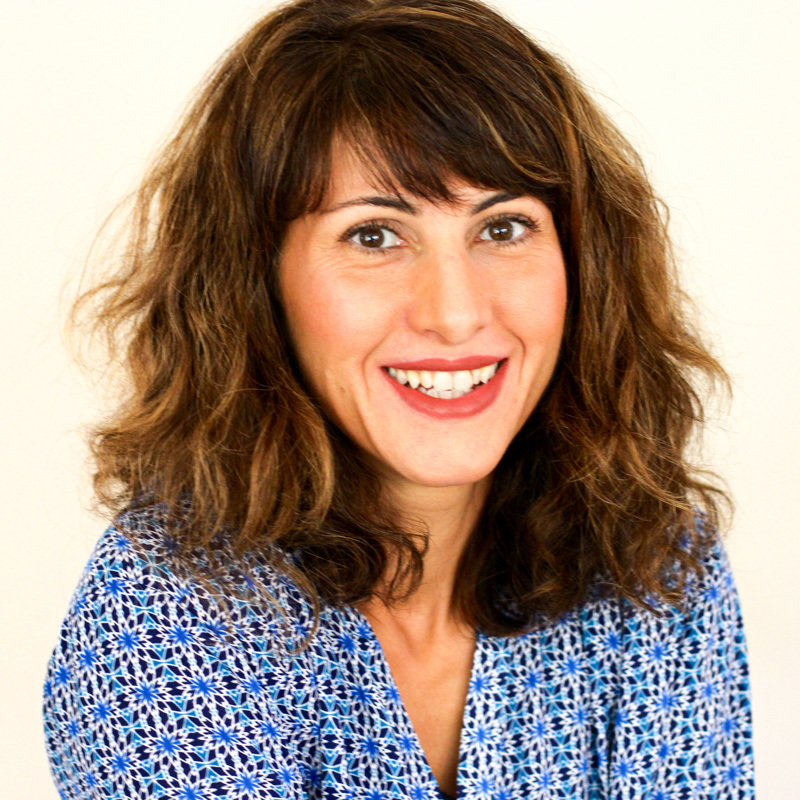 We want good food, despite living without gluten and dairy (and eggs). And consistent. And perfect, as they stack up by our side tempting us to sneak one (as some of us might do, no confessions!) while flipping away. Wait until you taste these. You will not believe this (healthier) is gluten free and vegan. Ah, we are ready for pancakes … see the large bubbles? That means we have hit the caramelization stage. We don’t want the bubbles to get much larger than this or the sugar will start to harden like candy. Sidenote: See the large bubbles? That means we have hit the caramelization stage. We don’t want the bubbles to get much larger than this or the sugar will start to harden like candy. Because little ones (and big ones!) can get antsy waiting around when they begin to smell pancakes I clocked it from the time I turned on the gas until the last flip of pancake number 44 (!) to give you a “total time” that is as accurate as possible considering stove top heat may vary. 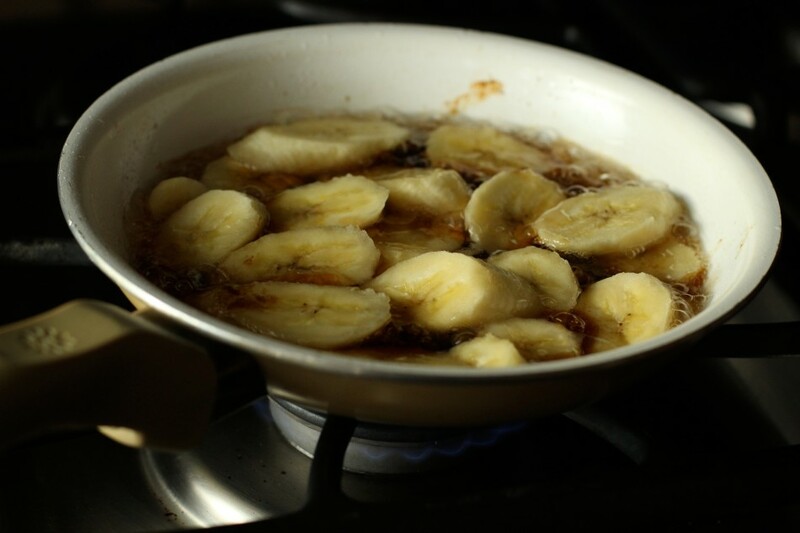 To speed things up: I make my caramelized bananas the day before and prepare all my dry ingredients (whisked) too. Psst. From one pancake flipper to another: plate quickly. And keep an eye on your golden stack. Consider that a warning. My boys slowly come up from behind, just when I begin pouring for the next round and grab with lightning speed from the stack. My younger ones are the fastest. That includes trying to take photos for you guys. Photos? Who cares about that. 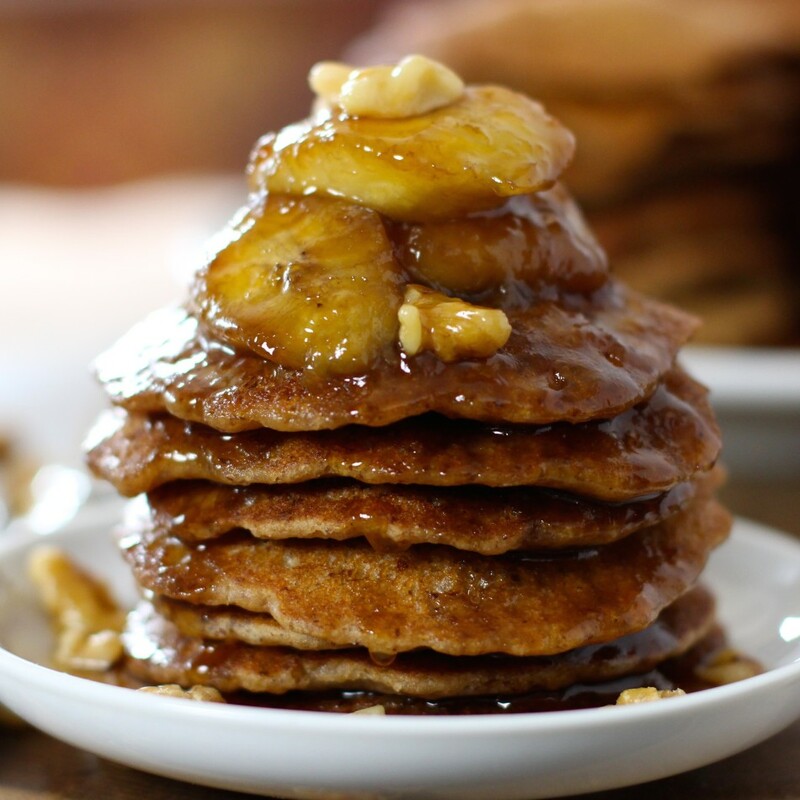 Light, fluffy banana walnut pancakes filled with chunky banana pieces with a good helping of caramelized bananas on top because, hey, it's the weekend. Enjoy! 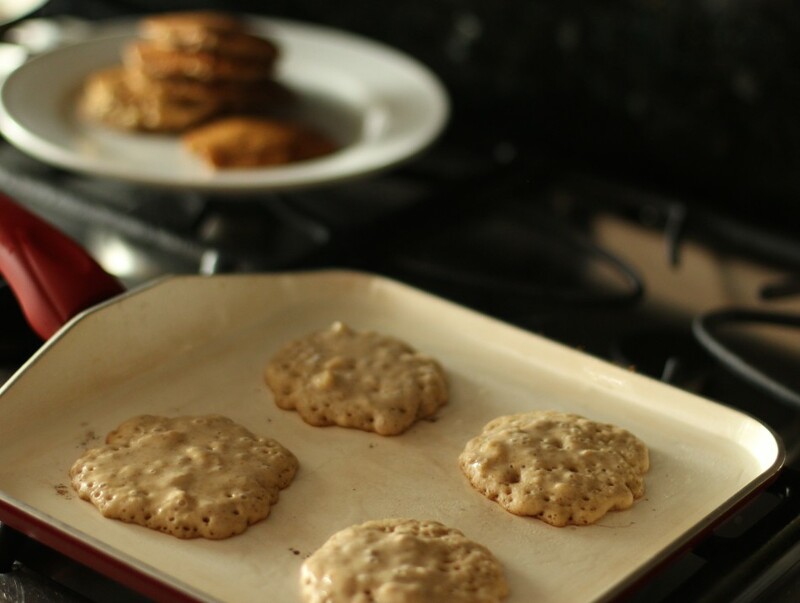 Note: You will need a blender, food processor or immersion blender to aerate these for best results. Pancakes are about 3 inches round. Note: This can be made ahead and reheated before serving (I do this all the time) or prepare before the pancakes on the same day. In a medium, non-stick skillet set on medium heat, add coconut oil and coconut sugar. When it liquifies raise the heat to medium high and cook for 1 more minute. 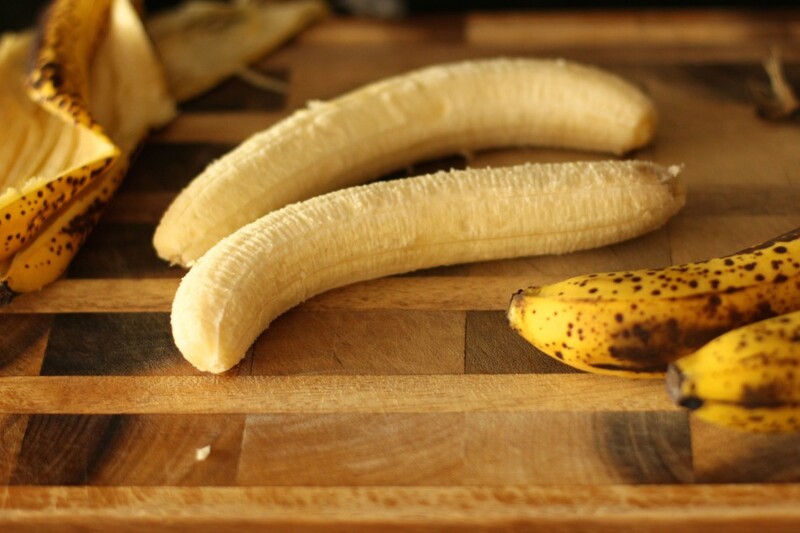 Add the sliced bananas, swirl the pan around so that the sugar coats all the banana slices. Let it cook another 2-3 minutes, until you begin to see large bubbles forming and the bananas have darkened. Turn off from heat and set aside. If needed, reheat before serving. Put all the ingredients, except bananas and walnuts, into a blender, pulse until smooth. 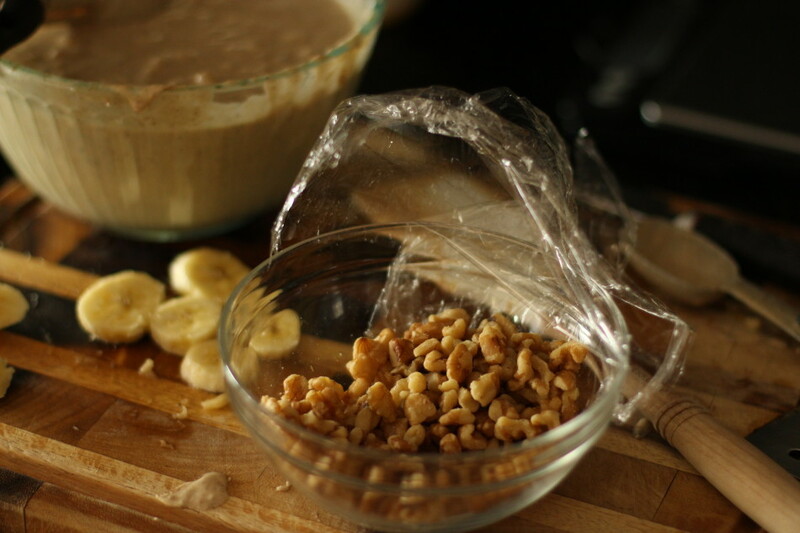 Transfer to a bowl, then combine diced banana and walnuts. Add about a tablespoon of coconut oil to a non-stick skillet and set over medium heat. Note on my skillet: I use a ceramic coated non-stick that is PFOA free instead of a teflon coated non-stick, coated with aluminum (see why below). Using a small ice cream scooper, or a tablespoon sized measuring spoon, add the batter to the hot skillet and cook for about 3 minutes, or until bubbles have formed around the edges with some in the center. When you see that air bubbles have pretty much been formed all over gently shimmy (for lack of a better word) a spatula under the pancake and flip over to cook the other side for about a minute until cooked through. Keep in mind, there is no egg in here to bind the batter If you push the spatula under quickly it could gather into itself should you happen to flip too soon. After the first one you will have a better idea on whether it’s sooner or later than 3 minutes to flip as stove top heat does vary. Add about ½ - 1 teaspoon of coconut oil between batches. 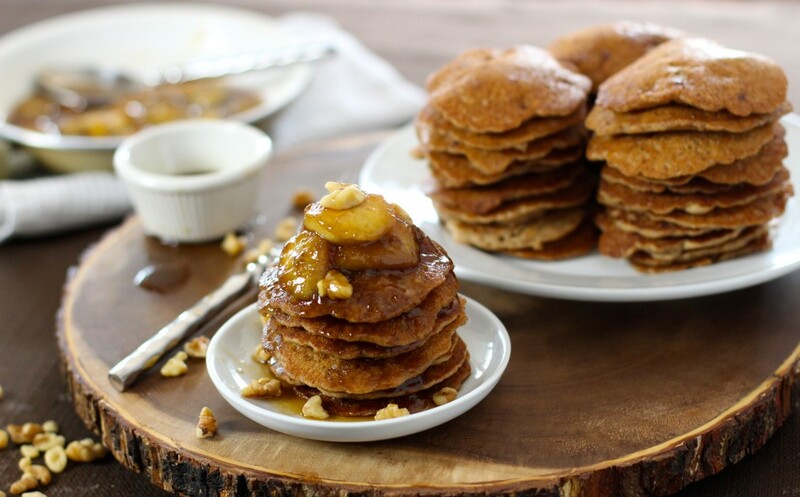 Discard any batter scraps from the pan before each batch so they don’t stick to the pancakes. 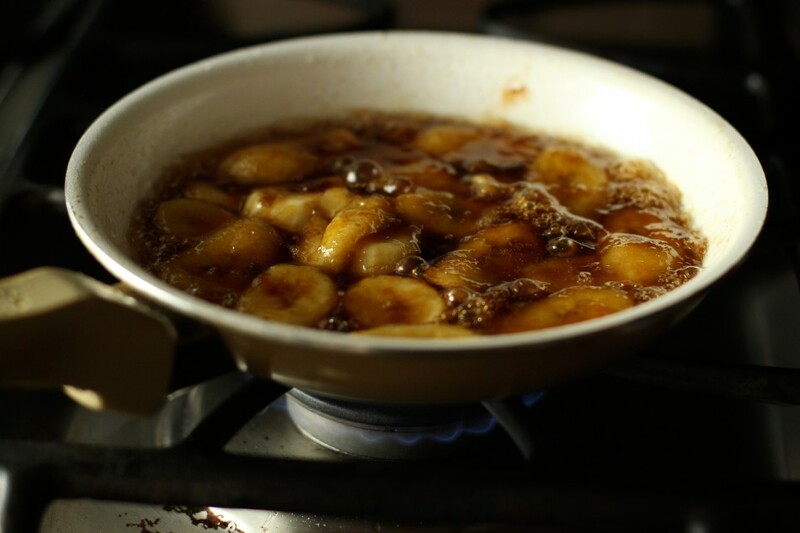 Serve hot with caramelized bananas, walnuts, and maple syrup. Note of using oil for greasing: Using a vegetable oil or grape seed oil will create a ring along the edge of the cooked pancakes. If you do not have coconut oil and don’t mind that use a “high heat” oil for best results. Note of cooking: I find a metal spatula works best, just be sure not to scrape the surface of the pan. A plastic spatula pushes the pancake against itself creating flops instead of pancakes. Note about nonstick cookware: to prevent heavy metal absorption use non-aluminum non-stick pans like Green Pans coated with ceramic. Aluminum is a heavy metal that affects the neurological system. It attaches to fat, what the brain is mostly made of, and leeches into the food when the pan is hot. Yep, it’s bad stuff. The good news: ceramic coated pans are widely available now and inexpensive. This looks AH-MAZING Jessica! 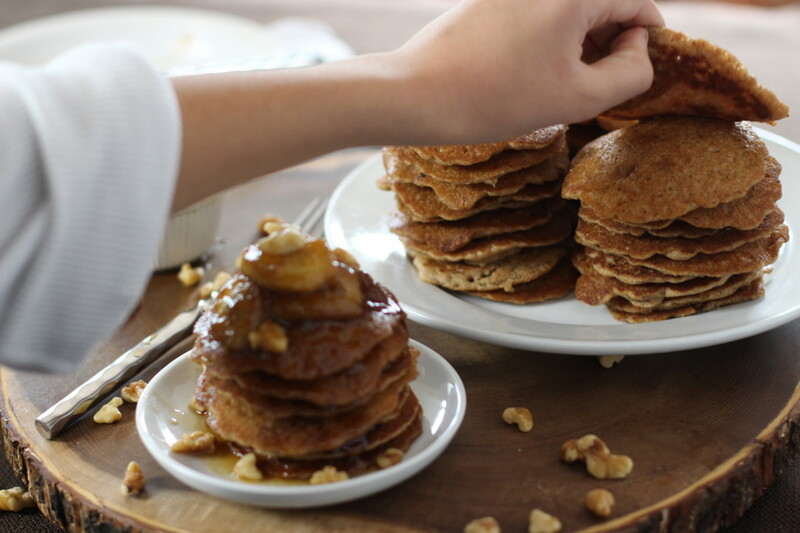 I agree, weekends are for carb loading and there's nothing better than a big stack of pancakes. Pulling out my blender for this! Gorgeous photos! YES I need this in my life "no guilt"! My quinoa bowl with berries is nowhere near as fun as having this. I think I need to step up my breakfast game tomorrow! Can't wait to try this!! Those photos are killing me! YUM. Jessica, do you think I can sub the two flours for coconut flour or chestnut flour? 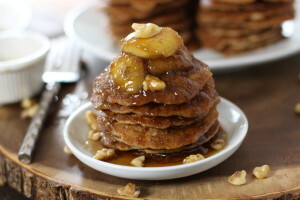 My boyfriend and I are trying to eat more Paleo and I definitely want to make this...thanks! Carly, Thank you! You can substitute with either I would imagine though I haven't tried it in this particular recipe. Coconut flour absorbs lots of liquid so if it happens to look too thick and difficult to pour I would add a little more liquid or eggs if you can tolerate them. Hope that helps :) Enjoy! I would much rather be eating this than working out. Being that these are healthier than most I have no guilt and will get flipping SOON! :) Pinning this! I'm always adding my spotted bananas into smoothies. I can't wait to try this! I think my family would be impressed by a breakfast like this. I don't have a blender but do have an immersion blender. Fingers crossed that it will come out as yummy as they look! Wish I woke up to a stack of these pancakes for breakfast this morning. They look epic! These were downright incredible! I went on a whim and made these today for a very late breakfast since I pretty much had all the ingredients except the soghum flour (used brown rice flour). I followed the recipe to a T. I see what you mean about how the blender mixes so well. Doing that for all my batters now. Everyone loved it and those bananas on top-killer!! I cannot wait to dig into this tomorrow! My much needed carby breakfast for my day off! YUM! I made these today and what a treat it was! They were light and fluffy and I wished I made a full batch instead of half. Next time for sure! Yay! I was saying the same thing when they disappeared before I got to round two. So happy you enjoyed them Zoe! This was one of the best breakfast pancakes I've ever had!!! Blender batter - genius! 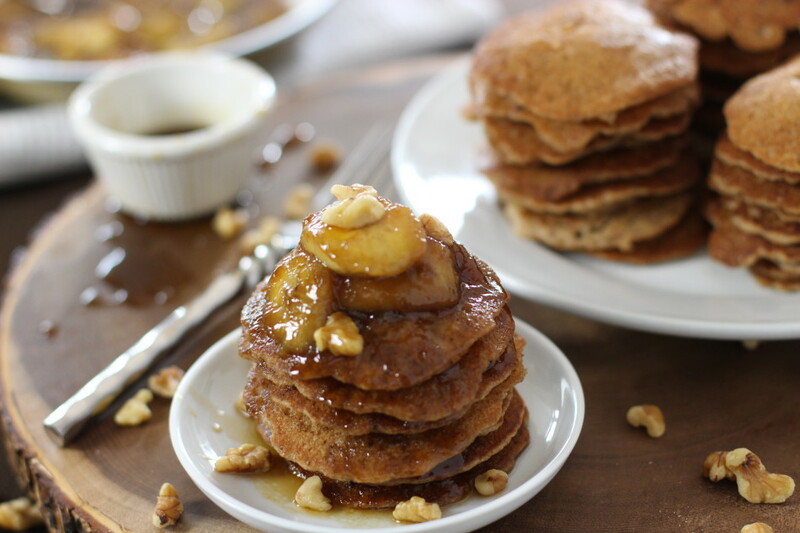 I pulled out my blender to make these pancakes today and holy cow are these amazing! That banana topping it's heaven!! Where has this been all my life? Clever idea to use a blender. My pancakes came out perfectly fluffy and delicious. What a nice breakfast treat on my day off! Popping the rest in the freezer! Happy to hear you loved it Jill! Pancakes were so easy and came out so delicious! Our family is new to gluten-free and dairy free so thank you for a great recipe and wonderful weekend breakfast!! YAY! Love hearing that - so happy you enjoyed it Thom!